How much does it cost to travel to Marbella? How much money will you need in Marbella? €93 ($105) is the average daily price for traveling in Marbella. The average price of food for one day is €31 ($34). The average price of a hotel for a couple is €98 ($111). Additional pricing is in the table below. These average travel prices have been collected from other travelers to help you plan your own travel budget. Marbella is a city in southern Spain in the province of Malaga. It is part of the Costa del Sol (Coast of the Sun) and is located on the Mediterranean Sea between Malaga and the Strait of Gibraltar. It is one of the most important tourist cities in the area and receives many national and international tourists year round due to its climate and tourism structures. Marbella is a bit of a glamorous city due to its beauty and resort-type environment. The old town with its narrow cobbled streets and flower-filled plazas is packed with shops and art galleries selling boutique clothes and accessories, and handmade wares. The city has significant archaeological and historical heritage and many events and performances throughout the year. Some of the most popular sights in the area include the natural beauty of the coastline and beaches of the Mediterranean with the rugged mountain range stretching out of the other side of the city. You can also see some of the master of Surrealism's signature unusual but brilliant sculptures just walking down some of the streets such as Avineda del Mar. Another popular sight is the King Abd El Maziz Mosque, which was named after the first king of Saudi Arabia and is built in the Andalusian style. The Casa del Corregidor is another popular site in Marbella. It was built in 1552 and combines Gothic and Renaissance elements. The main neighborhood in Marbella is the city center. This city center is a great place to find an urban environment packed with Spanish charm. This is the area where you will find Plaza de Naranja (Orange Square), which features many of the charming shops, boutiques, art galleries, and beautiful surroundings. This area is also known as Old Town and it is an area that values history over modernity. The streets of this part of the city preserves the irregular layout that is common of the Arabic era, although some of its narrow streets open onto plazas designed immediately after the Christian Conquest. Of its ancient heritage special note should be taken of the Alcazaba or the Castle, where the original Arabic city was founded. There is no shortage of things to do in Marbella. They have many activities and festivals to experience. One of their biggest festivals is the Annual Summer Fair. Every year at the beginning of June, Marbella pays tribute to its patron saint San Bernabe (Saint Bernard) with a week long fair. The Marbella fair includes all the traditional elements of a Spanish fair: food, drink, dancing, entertainment and of course, the trademark "casetas" that are set up just for the fair. There are several other exciting festivities to experience in the area, but during times when there are no festivals going on, there is still plenty to do. One favorite activity of many is to enjoy the miles of gorgeous, sandy beaches on the Mediterranean, and maybe even go for a swim in the warm waters there. Walk down the beautiful promenade to take in some of the Mediterranean sights. Go for a hike in the nearby mountains. Or for something a little more adventurous, try a buggy safari, which will let you experience the rugged red country surrounding Marabella. Marbella offers exquisite cuisine and culinary options. Because of its location on the Mediterranean, seafood is one of the best and most common fares, but there are also other flavorful options. One dish to watch for in the area is the Sopa Campera. Its main ingredients are tomatoes, onions, garlic, peppers, green asparagus, stale bread, and sometimes seafood can also be added, depending on the chef as well as the taste of each person. Another dish to look for is the Malaga style salad, which is a light salad of potatoes and olive oil, that also has tomatoes, peppers, onions and either tuna or cod (the original is with cod). A few restaurants to try in Marbella include Paco Jimanez, serving an eclectic Mediterranean menu, Restaurante Messina, which serves a bit more exotic dishes such as crab curry ravioli, and Marbella Patio, which serves more traditional Spanish cuisine. 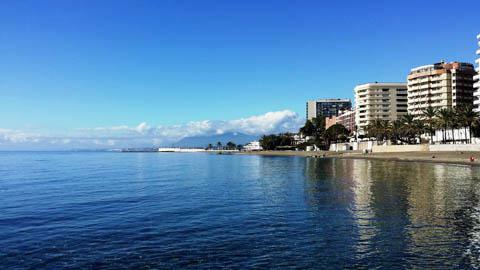 Marbella does not have an airport inside the city, but there is one nearby, the Malaga Costa Del Sol airport, which is the fourth busiest airport in Spain and hosts many international flights. There are buses available from the airport into Marbella, as well as the option of a taxi ride. The bus system in Marbella is reasonably connected. You can reach many of the main cities in the Costa Del Sol via the intercity bus system, including: Malaga, Ojen, and Ronda, some of the bigger cities not too distant such as Seville, Cadiz and Granada, and two of Spain's major cities, Madrid and Barcelona. But Marbella does not have any rail transport. It is the only city in Spain whose population is more than 100,000 that does not have a rail system, which makes it a bit unusual, so railway is not an option from within Marbella.